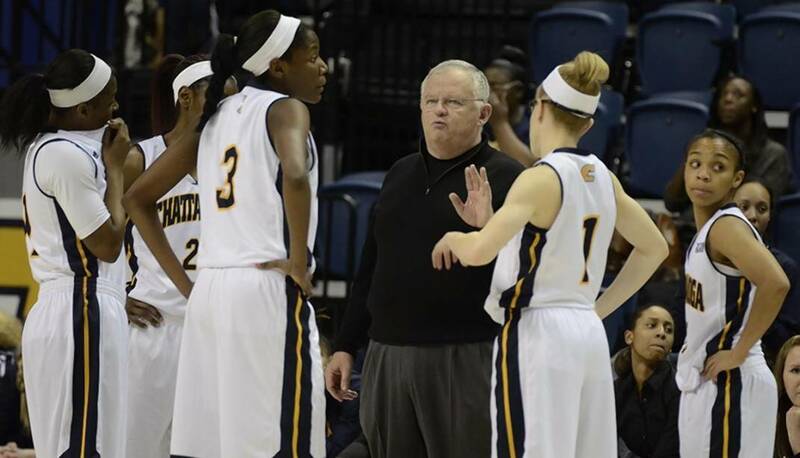 UTC women's basketball coach Jim Foster talks to his players during a game last season. The University of Tennessee at Chattanooga women's basketball team received a preseason ranking of No. 25 in the first Associated Press poll, released Tuesday. UTC head coach Jim Foster also became the first coach to have four separate programs ranked in the preseason top 25, having also done so at stops at St. Joseph's, Vanderbilt and Ohio State. It's the first time that the program has received a preseason top-25 ranking by the AP. They spent a majority of the 2014-15 season ranked based on the strength of wins over then top-10 opponents Tennessee and Stanford. They finished the year with a 29-4 record, falling to Pittsburgh in the first round of the NCAA tournament. Four starters return from that team, along with the return of Aryanna Gilbert — who missed the majority of the year with a torn ACL — and transfer Queen Alford, who sat out last season after spending two seasons at Jacksonville University. The Mocs have games with four teams ranked in the AP top 25: top-ranked Connecticut, who the Mocs host on Nov. 30; and away games at No. 4 Tennessee, No. 16 Stanford and No. 20 South Florida.